The Information Technology (IT) and Telecommunication (TelCo) sectors face enormous integration challenges, due to the prominent heterogeneity in existing systems. Service-oriented computing tackles such challenges by providing a fundamental platform that facilitates the convergence of distinct domains based on Web Services (WSs). With the mobility and technological advancements, service-oriented computing has been pushed towards the mobile sector enabling P2P Mobile Web Services (MobWSs) provisioning. 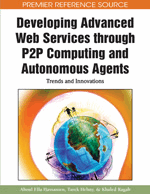 In this work, we investigate the interaction, architecture and design characteristics of MobWSs for P2P computing. Here, the two MobWS interaction strategies are presented followed by the architectural discussion, enfolding server and client side components, of a resource-oriented MobWS framework. We follow REST design principles to propose an efficient way of architecting P2P MobWS systems, as an alternative to SOAP, enabling significant payload reduction and performance optimization in mobile servers. The detailed performance evaluation is also presented and compared to SOAP based on real-time measurements. By analyzing performance characteristics, we show that REST is a promising technique to architect P2P MobWS systems for resource-constraint mobile nodes. The convergence of IT and TelCo face enormous research challenges due the existence of heterogeneity in corresponding systems. Rapid advances in technical and technological aspects of these domains intricate the integration requirements while blurring the intersection point. Service-oriented computing is a middle-tier paradigm that facilitates the integration of IT and TelCo domains by providing services with standardized access interfaces. Within the research and industrial sectors, the reference model for Service Oriented Architecture (SOA) is currently the most promising and widely accepted standard for understanding the relationships and integration requirements of dynamic, heterogeneous and distributed entities in service-oriented systems (MacKenzie et al., 2006). From the technology point of view, wide range of competitive SOA implementations exist that help innovate numerous service-oriented business cases and applications. In recent years, WSs specified by the World Wide Web Consortium (W3C)1 have evolved as a highly-regarded implementation of SOA for systems’ integration. The Internet and mobile networks have started to merge based on WSs spotlighting high-valued consumer and business services, and use cases. The combination of mobile communication systems and WSs is seen to have a high economical potential in terms of WS provisioning from a mobile node, called MobWSs. From research and technological perspective, the process of maturing MobWSs is ongoing; however several challenges must be met to enable a free integration of P2P MobWS systems into IT and TelCo domains. Though WSs are regarded as an application integration tool due to their interface uniformity, extensibility and neutral behavior towards heterogeneous systems, they tend to introduce more transmission and processing overheads due to extremely long SOAP messages integrating various WS standard specifications. Research efforts have been put towards transitioning from a SOA to the Resource Oriented Architecture (ROA) where WSs exposed as resources are directly accessible using the existing Internet standards. Representational State Transfer (REST) is a style for designing distributed software architectures that are based on resources within the network and can be defined as an implementation of ROA. Fielding (2000) defines REST as “a hybrid style derived from several of the network-based architectural styles and combined with additional constraints that define a uniform connector interface” (p.76). Analogous to the client-server architecture, REST is not a standardized style for architecting networked-software; however it strongly couples and relies upon the existing Internet standards, such as HTTP and URL. Contrary to the dependency of WSs on SOAP, the messaging in REST is format-independent and strictly relies upon the application requirements, typically being in HTML, XML or JSON document format. Originally, REST was defined for information and media access, but the rapidly growing research and industrial communities have adopted its design principles for WS interactions as well. The representations in REST are defined by the format of information (HTML, XML, JPEG, GIF or JSON etc.) accessed as a resource on the network. As a consequence, the response places the requesting node in some state. Each subsequent resource access transfers the node from one state to another, hence resulting in a ROA. MobWSs facilitates P2P service provisioning from resource constraint devices. The range of these devices is not limited and can be categorized as consumer-oriented (CO) or process-oriented (PO) mobile nodes. The CO mobile node, such as a smart phone or PDA, provides direct interaction of an end user with the MobWS, whereas in a PO device the services are perceived as embedded or backend processes of some large and highly distributed infrastructure, such as Wireless Sensor Networks (WSNs). The requirements of MobWSs for each type of device are derived from the application context. Limited configuration in terms of processing, battery and storage resources is the shared property of both categories of nodes. Therefore, provisioning MobWSs, with aforesaid restricted degree of technological and resource freedom, to perform P2P computing is a scientific challenge.